Jodhamal Public School celebrated its 14thAnnual Sports Day on Tuesday, 16thOct 2018in school sports ground with great grandeur. The event was presided over by the chief guest Mr MY Kitchloo, comdt.Jammu and Kashmir Armed Police 4th sec.Bn and guest of honour, Ace sports administrator and former National Cricketer, MrRanjeetKalra and Trustee MrNandankutiala,DirectorAratiKuthiala, Principal MrTrilok Singh Bistand Vice Principal MsshefaliSanwal. The programme began with the melodious VandeMatramSong and all the students especially participants were very excited. 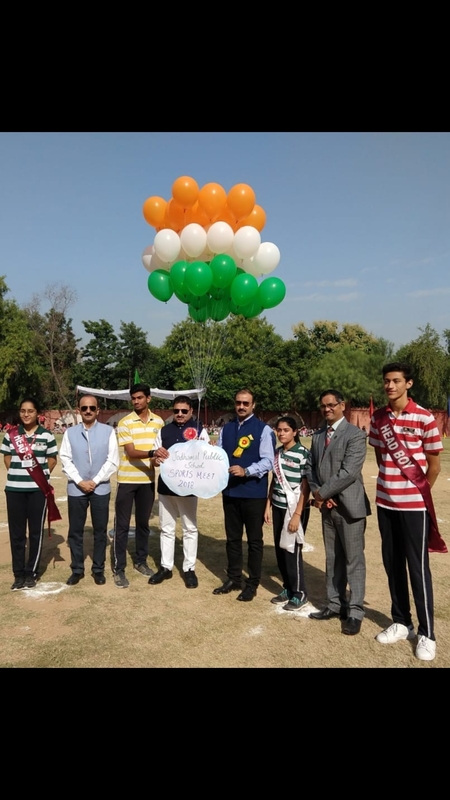 The series of events started with the ceremonial torch led by Panniniand the various national players of Jodhaml Public School which evoked God’s blessings. Pannini the Sports Captain (Boy) welcomed the Chief Guest and the dignitaries by a short speech and asked the players to play with sportsmanship and to follow the discipline of the game.Deputy Head Boy Vidur Kumar introduced the Chief Guest and Guest of Honour with a short welcome speech. The School Vice Principal ShefaliSanwalin her speech welcomed the guests, parents and all the spectators. Mrs. Sanwal said that sports helps much more than its physical aspects, it builds character and develops team spirit. It is the day for the students to free themselves from the fetters of mundane classes to play and run. The most intriguing aspect, embellishing the event, was the splendid field displays, involving mass student participation, which splattered on the field, a riot of hues and vibrance music of school band. The students showcased their talents in Swimmathon,Skatathon, 100 Meters Race, 200Meters Race, 4 x 100 Meters Relay Race, 800 M race,Three Legged Race,Prick the balloon,Ball collecting , Sack race, Obstacle Race, spin and run and lemon and spoon race. The events filled in the hearts of everyone with the spirit of sportsmanship and unity. When the melody plays, footstepsmove, heart sings and spirit begin to dance, Zumba dance is a great way to exercise and fellowship with other people in a fun atmosphere, it remained as the main attractions of this mega event. The zealous parents gathered in large numbers and constantly applauded the participants of the field track displays. Ms.ShefaliSanwalthe Vice Principal addressed the audience by saying that Jodhamal Public School does not shy away from its social responsibility and believes that it can work in tandem with the society .The School was once again ranked no 1 in the state of J&K for the fourth year in a row and ranked no 3 country wide at EW Elite ranking in collaboration with Harvard and Stanford university. Mr.MY Kitchloosaid that he was impressed and overwhelmed to see JodhamalAthletes and the vibrantdemonstrations put up by the students. He appreciated andemphasized the importance of sports and said that it was a pleasure to see how students of Jodhamal School had eluded the addiction of social media and were breaking away from the constraints of the four walls of the house hold and were actively nurturing their skills according to their potentials to build a harmonious spirit. He advised students to excel in academics along with games and sports.Mr.MY Kitchloo was very happy to see the facilities provided to the students and complimented the Principal, Teachers and Management for being Ranked No.1 School in the state of J & K and No.1 in Jammu City, consecutively for the 4th year. The winner house from junior school for skatathon was Invention houseand from the Middle school for,100 Meters trophy went to Invention house and for 200 Meters discovery house got the trophy , in 400 MtsRelay Invention Housewon the race. The winners werehonored and awarded by the Chief Guest. The Sports Trophyfor the best house went to the Enterprise House while Invention house got first runner-up trophy and 2nd Runners up house went to challenge house.Best Athlete of the year award went toPannini(boy) and Saman (girls) from Senior Wing. MrNandanKuthiala, the Trustee of the school presented a token of gratitude and appreciation to the esteemed Chief Guest Mr.MY Kitchloo. The Meet culminated withthe soothing and pious chanting of shloks by the talented girl of JMPSMuskaan,andArshpreet followed by the National Anthem. A vote of thanks was proposed by School Sports Captain (Girl), Akshita, who thanked the Chief Guest for sparing his valuable time to be there to inspire the student community. All the students, teachers, Principal,Management and Parents present on the occasion were also thanked for sparing their valuable time to be there to encourage Jodhamal students. Sahodaya Inter School Roller Skating Championship was organized by Sahodaya Jammu at Jodhamal Public School, Jammu. It was an event of its kind where more than 20schools participated from all the elite schools of Jammu &Kashmir. Ms. Vijay Puri, an eminent Educationist and National Coordinator of All India Edu Leaders Forum, New Delhi,inaugurated the function and declared the Championship open amidst lots of fun and frolic. 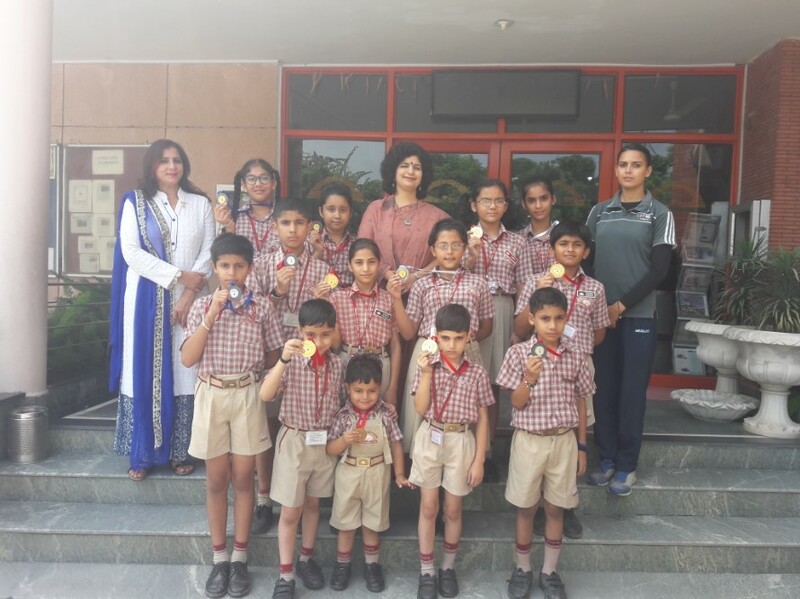 Jodhamal students won the maximum number of medals 10 Gold, 07 Silver and 10 Bronze in the championship whereas Heritage school won 07 gold, 06 silver and 02 bronze and MHAC Nagabani School won 06 Gold, 05 Silver and 01 Bronze . The list of medal winner is as follows:- In the Gold Category, the winners are :300 MeterAdvitya Sharma, Sumukhi, ArchitPandoh, Raghvi Singh, Rajveer Singh, Shrnaya Sharma, Yuvraj Singh, GursimarKour, KartikeyaPuri, Diya Rajput, Vanshdeep, SaanchAnand–500 Meter - Advitya Sharma, Sumukhi, ArchitPandoh, Raghvi Singh, Shrnaya Sharma, Yuvraj Singh, VartikaAnanad, KartikeyaPuri, DhruvGandotra andSaanchAnand. In the Silver Category, the winners are : 300 Meter –RayaanAyub, Vivaan Gupta, Kamya Gupta, Anshwardhan Jain, Mehar Gupta, Eklavya Mahajan, Ayesha Hayyat, Ranveer Singh, AadyaSambyal, Veer Manhas, SehajVarinder Kaur, DhruvGandotra, Anshika Jain 500 Meter – Vivaan Gupta, Kamya Gupta, Anshwardhan Jain, Mehar Gupta, Ayesha Hayaat, AkarshitMansotra, VartikaAnanad, SakshamKharbandha, Vanshdeep andAnshika Jain. 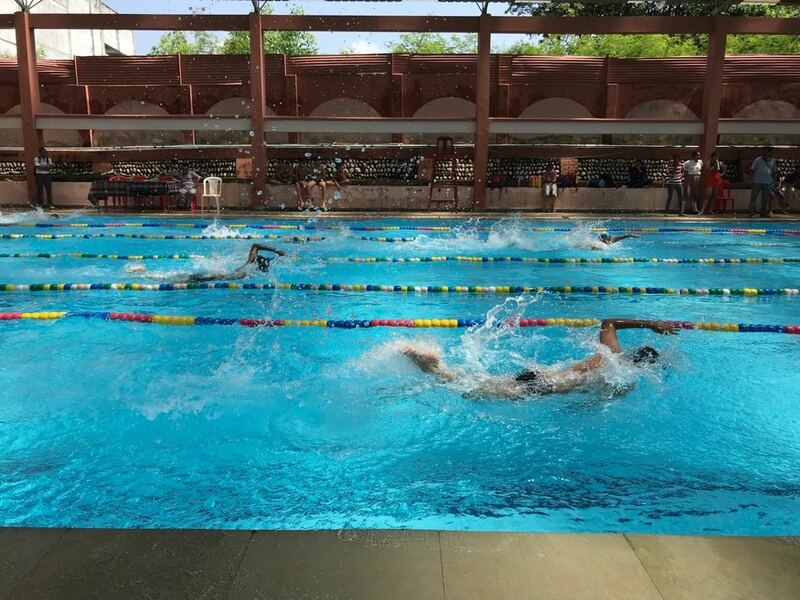 In the Bronze Category, the winners are : 300 Meter –Vivaan Gupta, SerishAbrol, Ryan Gupta, Kamakshi Sharma, SakshamKharbandha, Livanya Mehta, Soham Gupta, Archie Gupta, Bharat Raj, Czia Raina, AkarshitMansotra, VartikaAnand500 Meter – PuneeshPuri, SerishAbrol, Ryan Gupta, Kamakshi Sharma, PuneeshPuri, AnushkaJasrotia, Rajwardhan Singh, AadyaShambyal, Veer Manhas, Soham Gupta and Archie Gupta. 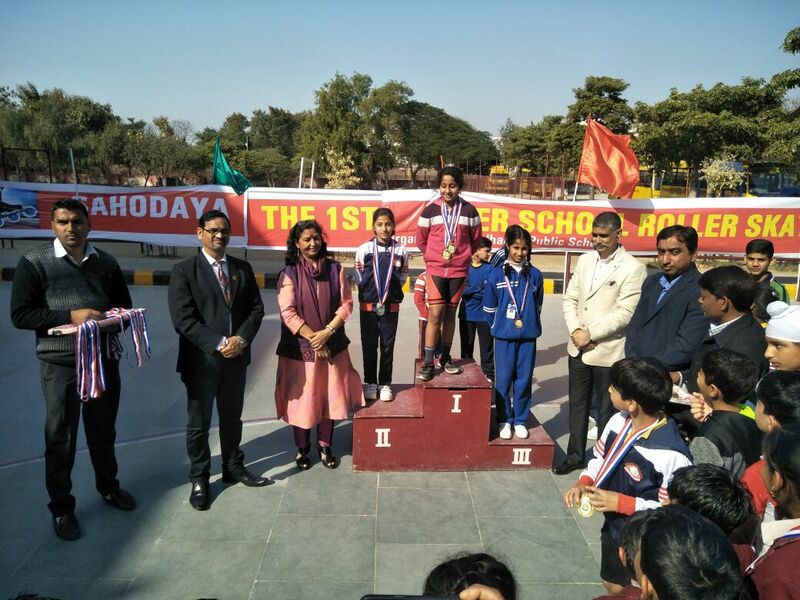 All the winners were awarded the medals in the closing ceremony by the Chief Guest, Ms. NirmalMahana, the General Secretary of Jammu Sahodaya and Principal of DPS Kathua. Mr. Rajesh Kumar, an International skater was present as a special guest. Jodhamal being a host passed the trophy to the runner’s up school. The School Principal,MrTrilok Singh Bist felicitated the winners in a special assembly in the school and congratulated Mr Kamal Anand and MrRiteshJamwal, Coach Jodhamal School for organizing the event. Jodhamal Public School in collaboration with Time of Sports has become the first STEM approved school in J&K and North of Delhi. STEM program is an International school based program to enhance the creative and engineering skills of students in SCIENCE, TECHNOLOGY, ENGINEERING and MATHS. This unique global platform, innovative in nature, is active in nature in 44 countries. The STEM Program is multi-disciplinary challenge in which teams of students aged 9 to 19 deploy CAD/CAM software to collaborate design, analyise, manufacture test and then race miniature compressed air powered balsa wood F-1 cars. 2 teams from Jodhamal are participating in the National F-1 in school challenge being held in Delhi. The two teams are CARBON CREW & FUSION 5. School teams from 20 states are alsoparticipating in this PAN INDIA competition. The crew of FUSION 5 are Sparshdeep Singh, NamanChandhoke, Sarthak Malhotra, Harvir Singh and Dakshesh Sharma and CARBON crew are RudrakshBhalla, AsmitSachdev, SubhangSethi and Suvinay Jain. Team are mentored by MsRoopinderKour and MsNeetuJohri. The teams have been sponsored by P. R. AUTOMOBILES (SAWRAJ MAZADA), NATIONAL GARAGE (JEEP & FIAT) & KAVERY DECORATIONS. Jodhamal Public School celebrated its 13thAnnual Sports Day on Tuesday, 17thOct 2017 in school sports ground with great zeal and fervor. Mr. Ashok Bhan (DGP), J&K Retd, was the illustrious and Hon’ble Chief Guest and Sh. Nandan Kuthiala, Trustee of the school as the Guest of Honour. 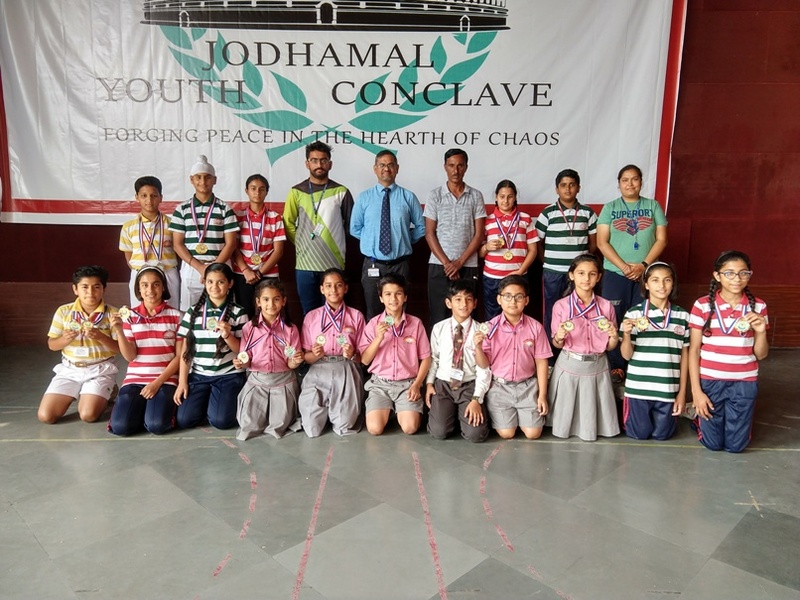 The series of events started with the ceremonial torch led by Abhishek Abrol & the various national players of Jodhaml School, evoked God’s blessings. Vidur Kumar the Sports Captain (Boy) welcomed the Chief Guest and the dignitaries by a short speech and asked the players to play with sportsmanship and to follow the discipline of the game. The School Principal Trilok Singh Bist in his speech welcomed the guests, parents and all the spectators. Mr. Bist said that sports helps much more than its physical aspects, it builds character and develops team spirit. It is the day for the students to free themselves from the fetters of mundane classes to play and run. The most intriguing aspect, embellishing the event, was the splendid field displays, involving mass student participation, which splattered on the field, a riot of hues and vibrance music of school band. The students showcased their talents in Swimmathon, Skatathon, 100 Meters Race, 200Meters Race, 4 x 100 Meters Relay Race, 800M Race, Fireman Lift, One Legged Race, Balloon busting, Ball collecting , Sack race and Obstacle Race. The events filled in the hearts of everyone with the spirit of sportsmanship and unity. The Nuan-Chuk and Segway demonstration by Arnav Malhotra left the spectators spell bound. The Rhythmic Artistic Yoga on soul – stirring music and the breath taking Aerobic performance ( Jai Ho) remained as the main attractionss of this mega event. The zealous parents gathered in large numbers and constantly applauded the participants of the field track displays. Ms. Pooja Panthri the Vice Principal proudly announced that the School Principal Trilok Singh Bist was conferred upon by the prestigious CBSE award for the Best Teacher, in recognition of his unparalleled services in the field of Education. Jodhamal Public School does not shy away from its social responsibility and believes that it can work in tandem with the society .The School also finds its place in the List of Future 50 Schools of the country. Mr. Ashok Bhan said that he was impressed and overwhelmed to see Jodhamal Athletes and the vibrant demonstrations put up by the students. 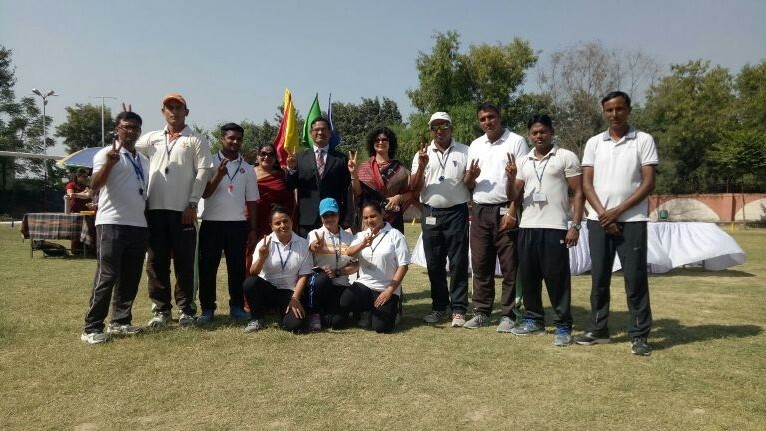 He appreciated and emphasized the importance of sports and said that it was a pleasure to see how students of Jodhamal School had eluded the addiction of social media and were breaking away from the constraints of the four walls of the house hold and were actively nurturing their skills according to their potentials to build a harmonious spirit. He advised students to excel in academics along with games and sports. Mr. Ashok Bhan was very happy to see the facilities provided to the students and complimented the Principal, Teachers and Management for being Ranked No.1 School in the state of J & K and No.1 in Jammu City, consecutively for the 3rd year. The winners in the Junior school for skatathon is Aditya Sharma (First Boys) , Ayesha Hayaat (First Girls). The winners in the Middle school for, 100 Meters , Farhan (First Boys) and Archie (First Girls) and for 200 Meters were Anuj Singh(First Boys), Angel (First Girls), in 400 Mts Relay (Boys) Challenge House won the race. The winners were honoured and awarded by the Chief Guest. The Best Sports Trophy went to the Invention House while Challenge was Runners up. . Best Athlete of the year award went to Harsh Khajuria(boy) and Saman deep and Diya Raina (girls) from Senior Wing There was a tug of war competition between the parents of JMPS which actually stole the show. As a gesture of his gratitude, appreciation and love from all staff and students, Mr Nandan Kuthiala, the Trustee of the school presented a beautiful memento to the esteemed Chief GuestMr. Mr. Ashok Bhan (IPS). The Meet culminated with the soothing and pious shlok by the talented choir group of JMPS, followed by the National Anthem. A vote of thanks was proposed by School Sports Captain (Girl), Irwin Kaur, who thanked the Chief Guest for sparing his valuable time to be there to inspire the student community. All the students, teachers, Principal , Management and Parents present on the occasion were also thanked for sparing their valuable time to be there to encourage Jodhamal students. 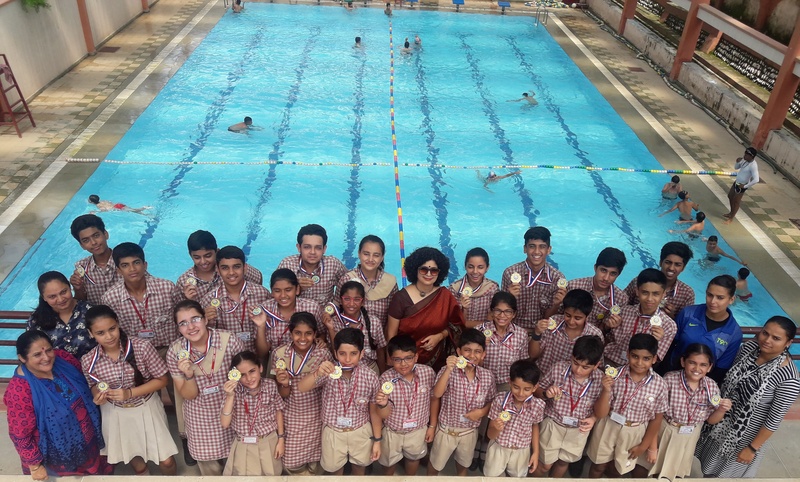 The students of Jodhamal public school brought laurels to the school by winning GALAXY of medals.---11 Gold, 08 Silvers and 07 Bronze Medals in the recently heldSahodayaInter school swimming competition at K C International school. About400 students from 12 different schools participated in the event. 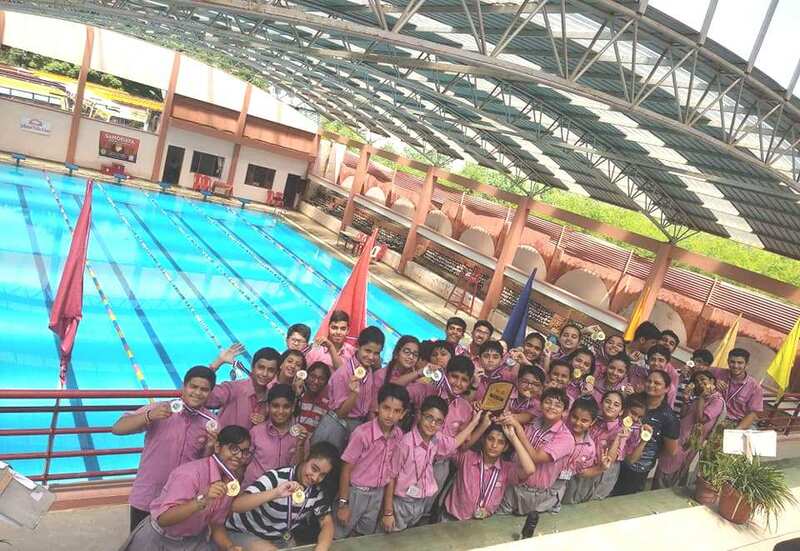 Jodhamal swimmers secured most of the medals in both the girls and boys categories and thus made their presence felt.The Jodhamal swimmers were declared overall Runner Up champions in both girls and boys category. The MEDAL WINNERS in U\10boys’scategory included Kanishk Kapoor 1 gold in 25mtrsfree style. KartikayeChoudharywon 1 gold in 50 mtrsbackstroke. 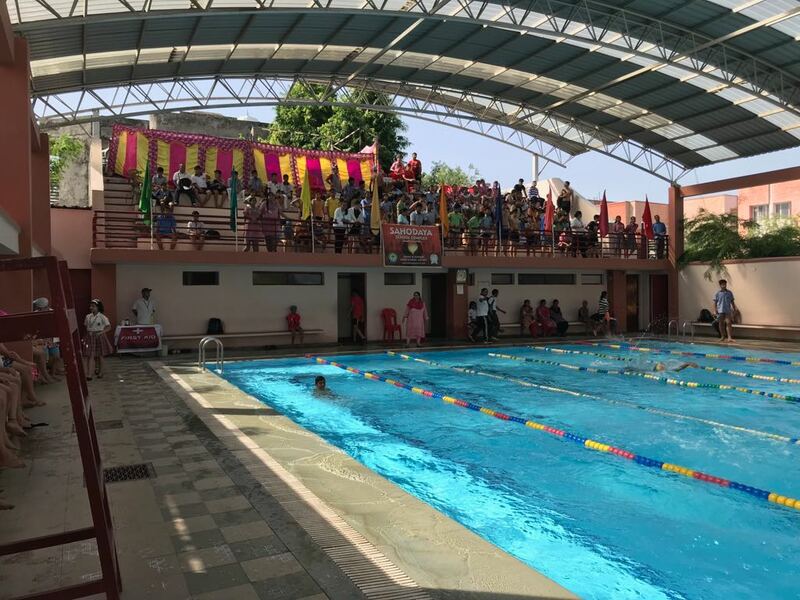 In 4 x 25 mtrs relay, 4 gold medals were won by Kanishk Kapoor, KartikayChoudhary, Aseed and Kartavayaand in U/10 girl’s category, Tanisha Jaggi won 1 gold in 25 mtrs breast stroke, AvniAethmea won silver in 25mtr breast stroke and Adalia won 1 Bronze 25mtrfree style. In U\14 Girls category Lakshita Reddy won gold in 25mtr in back stroke and in boy’s categoryPiyushKundalwon silver in 25mtrin back stroke. 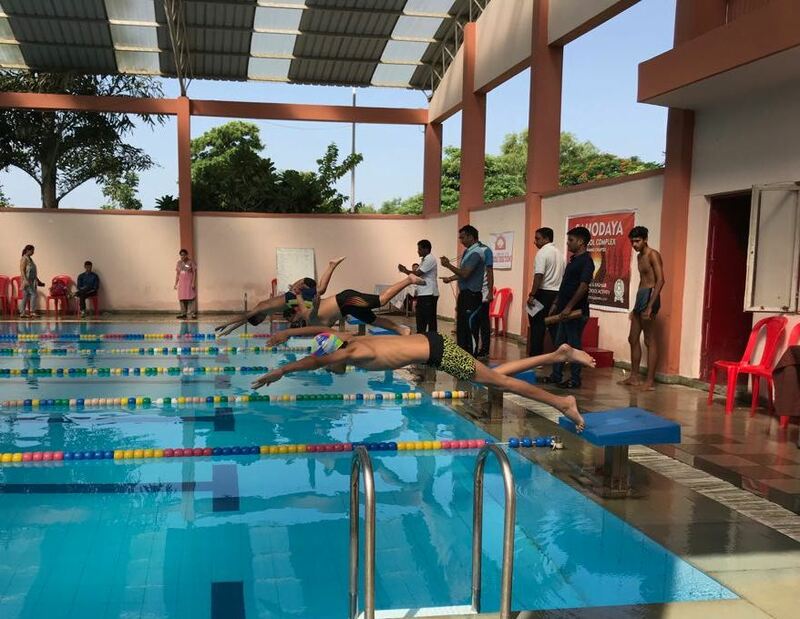 In the boys U\17 categoryVidur Kuma won 1 Gold in breast stroke and 1 bronze in 50 mtrs free style. DhairyaChoudhary won 1 gold in 100 mtrs free style and Silver in 50 mtrs back stroke. In 4x25 mtrs relay, Dhairyachoudhary, Vidu Kumar, Manik Jain and Ashmit won Silver and Prakul, Arjun, Utkrishtsingh and Samanyu Bhumi won Bronze. Saba Jamwal won Gold in 50 mtrs free style, Kusha Sharma won Gold in 25 mtrs back stroke and VarindaBasotra won silver in 25 mtrs free style. The winners were felicitated in the assembly by school principal. 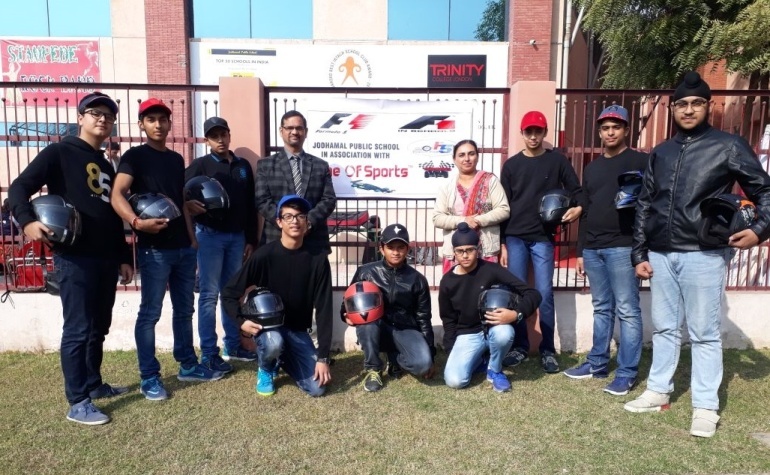 The Principal, Mr. Trilok Singh Bist lauded the efforts of the winners and stressed upon the players to achieve the pinnacle of success and become excellent players and also appreciated the efforts of the Swimming Coach Pooja Basan, ArunaJamwal and the HOD Sports SukomalGanguly for all the efforts made in honing up the talent of the students.